Bubble Wrap is normally used to secure delicate or breakable products whilst in shipping, and for packaging and storage, as well as when shifting household goods during a house move. This wrap is shock-absorbent, abrasion-proof and extremely light in weight. However, it is important to select the exact type of bubble wrap, depending on the size and type of goods, you are intending to pack. There are mainly two types of bubble wrap available - small bubble wrap and large bubble wrap. Small bubble wrap is known as the standard bubble wrap used in the market, with the bubbles being approximately 10mm in diameter. Other, large bubble wrap comes up with larger bubbles, approximately 25mm in diameter. Small bubble wrap is usually has a rolls of 100 meters, while large bubble wrap in rolls of 50 meters. 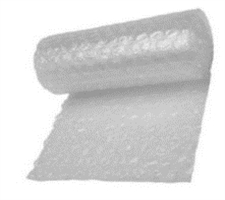 Both types of bubble wrap are available in varying widths. 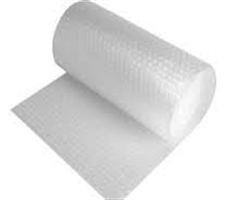 Bubble wrap rolls are widely used in all types of business. It's the most suitable packaging material that ensures the safety of your item all in one piece to their destination. We work the best to offer the cheapest small bubble wrap for our customers, via online or on the high street. Buy cheap bubble wrap for transit of small goodies such as electrical and jewelries; it is quite lighter in weight and come up in a varying lengths. You can conveniently wrap up your product, secure it with tape and send it from one place to another. Bubble wrap can also be used to pack huge items, especially important when it comes to items of a breakable nature. To secure all your shipping goodies, packaging tape is the strongest and easiest to use piece of packaging, made even more convenient by the tape dispensers.